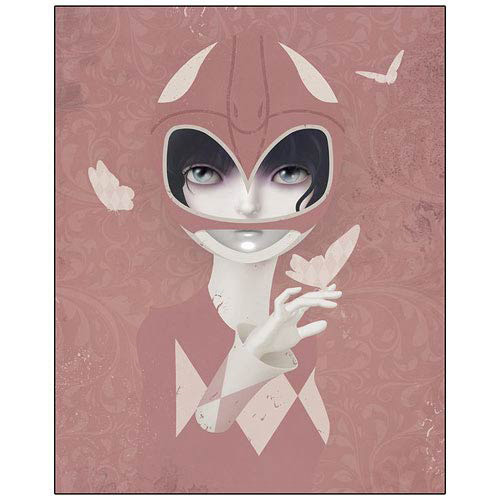 Mighty Morphin' Power Rangers giclee has been printed on paper! Limited edition giclee includes certificate of authenticity. Limited to 95 hand-numbered pieces! Do you have a checkered past? The Pink Ranger does! This Power Rangers Pink Ranger Checkered Past Paper Giclee Print is a gorgeous piece of artwork that features the Pink Ranger on an intricate pink background with paisley butterflies floating about. The Pink Ranger's face can be seen through the helmet, colored black and white, and is emblematic of how the character changed throughout the Mighty Morphin' Power Rangers series. Measuring 19-inches tall x 13-inches wide, this great giclee has been printed on paper, comes with a certificate of authenticity, and is a limited edition of 95 hand-numbered pieces. Ages 15 and up.